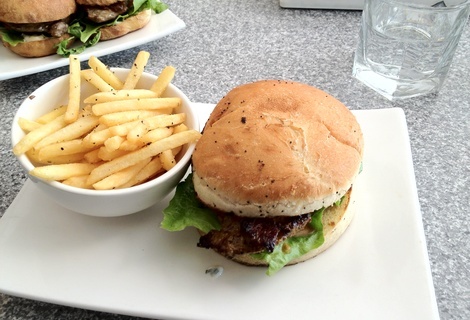 Subiaco small bar – Tasty burgers a short walk from Subi Oval. 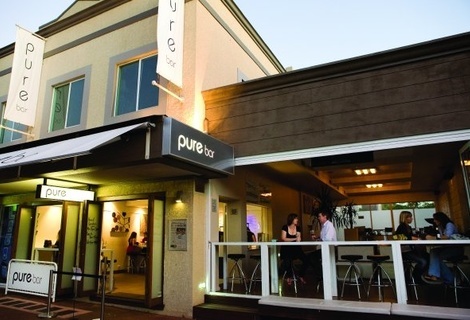 Pure Bar was reviewed on Saturday 2nd March 2013 13:53 by Richard. I'd been to Pure Bar a few times before this visit but only before a footy game for a few pre-game brews. To be honest I hadn't taken much notice of the bar as I was more concerned with enjoying as many reasonably priced, full strength beers as humanly possible before the short walk up to the oval. Maybe it's just me, but paying exorbitant prices for small mid strength beers doesn't float my boat, never mind missing a good portion of the game lining up with 40,000 other people. However, footy season was well and truly over the Saturday we headed down to pure bar so there was no rush to plough through beers, instead we grabbed a table inside and sat down for a late lunch and a few beers. Walking into Pure, you can't help notice the abundance of white, white walls, white tables, white chairs, it's almost got a clinical feel to it, but that quickly fades away once you notice the quirky signage postered around the joint as well the friendly service from both the bar and waitstaff. I had heard from a mate that if you're going to Pure Bar the burgers are a must-try, so when the waiter brought over the menu I went straight to the burger section. There was a fairly decent selection of food on their lunch menu especially for a small bar. It's not uncommon for small bars to offer little more than bar snacks (nuts, olives etc) but Pure have a good range of burgers, salads and tapas. 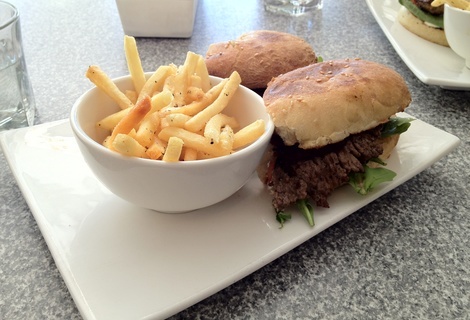 I went with the steak sanga and Matt opted for the lamb burger. Our food came out fairly quickly (10 – 15 mins) and was presented really well on the plate. My steak sanga was cooked a perfect medium and the addition of the caramelised onion and tomato relish gave it a great overall flavour. Matt's lamb burger was great too, the lamb was more of a lamb steak instead of a pattie – a pleasant change from the pub standard lamb pattie and it had just the right amount of seasoning from the Moroccan spices. The chips that came with both meals were great and would make for an excellent snack if you were just stopping by for a few drinks. Drinks-wise there was a fairly decent selection of wines, cocktails and bottled beers, but to my dismay no beers on tap. If I had one recommendation for Pure, it'd be to put in a couple of beers on tap, there's nothing like an ice cold tap beer on a hot (or cold) day. The next time you're after a casual lunch in Subi, away from the busy Rokeby road area, why not swing by Pure Bar for a brew and a beer. 6/10The Vic in Subiaco, WA (285m away)Great location near Subi Oval, decent food but average service.